Following yesterday's votes, the RMT have confirmed they will be holding a 72 hour Tube strike from 4pm April 24th 2012 in a row over pensions. RMT has been demanding that all Tube Lines staff, be allowed to join the TfL Pension Scheme and receive the same travel concessions as those who work for LUL, including former Metronet staff. This will affect the Jubilee, Northern and Piccadilly London Underground Lines. 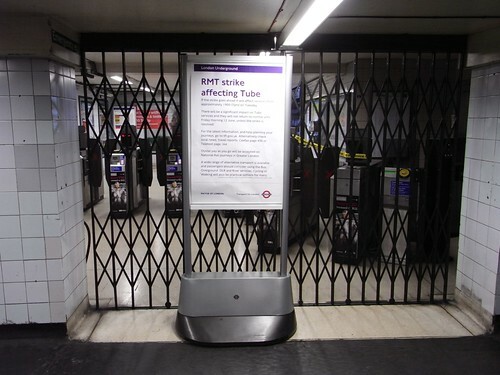 The RMT say "Parity would bring Tube Lines staff free travel within London and 75 per cent of the cost of travel on the mainline railway – the concession that all Tube staff, including ex-Metronet people, already get." “We have gone through all the negotiating channels on both these issues but Tube Lines has refused to budge and have refused to engage in meaningful talks and that pig-headed approach has raised the temperature on the shop floor and is reflected in this result. “Former Metronet employees have been allowed back into the TfL Pension Fund (TfLPF) and now also have the same travel facilities as other LUL employees. Tube Lines is now a wholly owned subsidiary of Transport for London and there is simply no excuse for refusing to give equal pension and pass rights." Watch the news and keep an eye on TfL's site for the latest on this. There's more on this announcement in The Telegraph.